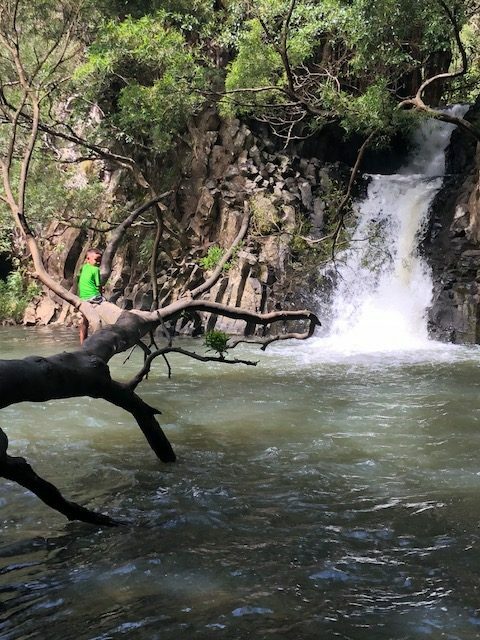 I think Maui is a great vacation destination anytime of year, whether you’re looking to travel as a couple, with friends, family or even solo! This summer, I was so excited to take my kids for the very first time, along with their Dad who had never been…plus my sisters and Mom joined us too. 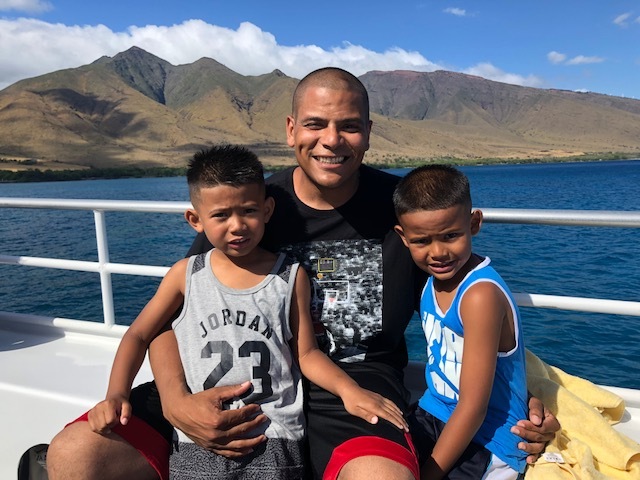 For me, it was my third trip to the island, and while I had already been able to explore much of the island, there was so much more I hadn’t done, and it was my first trip with my family. 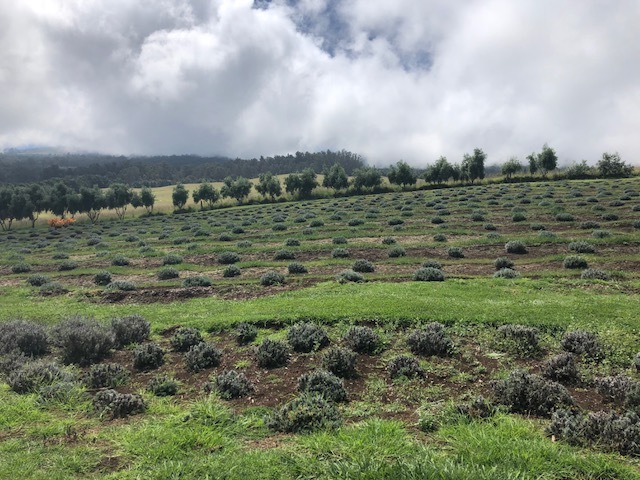 Ali’i Kula Lavender Farm – Take a drive upcountry to Kula where the temperatures are cooler and you can experience the beauty and agriculture of the island. This is an easy drive and you can spend as little or as much time as you want here (I’d say give it 2 hours). The farm’s slopes are filled with different varieties of lavender and there’s also plenty of other tropical plants decorating its landscape. My boys had a great time embarking on the farm’s scavenger hunt, and because of it we got to explore pretty much every corner of the farm and take in all the gorgeous views. Plus, they gave us a special prize when we completed the hunt. 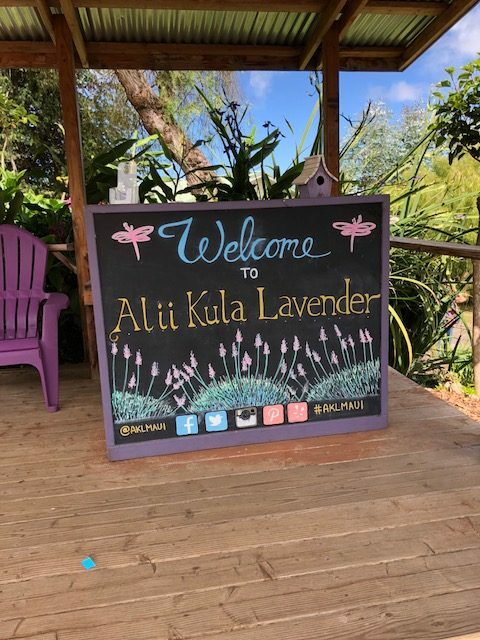 The costs to enter Ali’i Lavender Farm is minimal and they offer a military discount too! 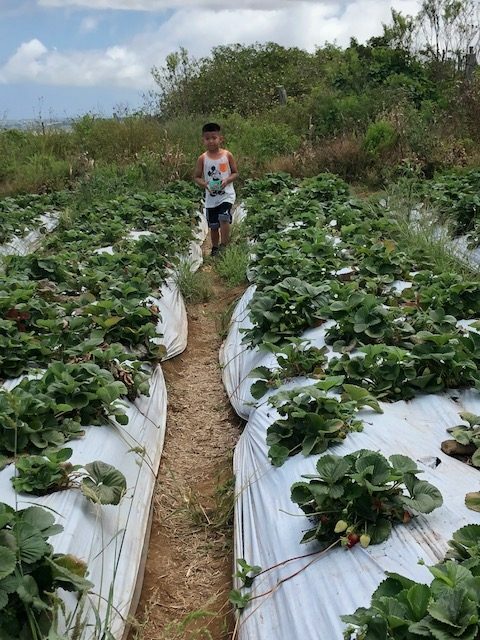 Strawberry Picking – If you make the drive to Kula, another fun stop is Kula Country Farms where you (and the kids) can pick your own strawberries. They also have a cute farm stand and offer island refreshments that make it worth the stop. Just pay for what you pick! 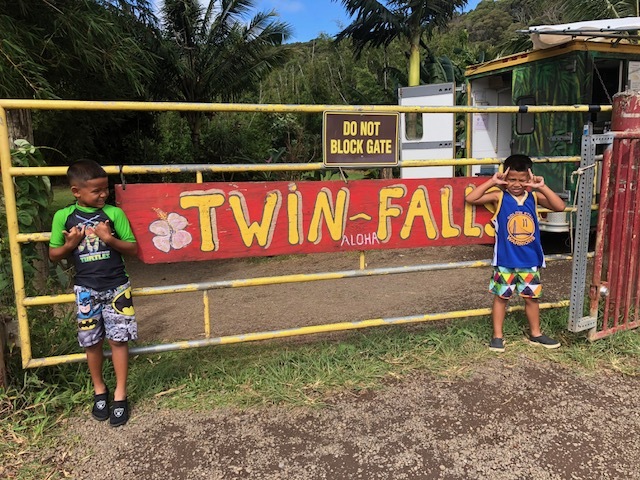 Hike to Twin Falls – One of the most popular excursions in Maui is the “Road to Hana.” I have done this drive before, and while it is beautiful and filled with awe-inspiring scenery, the thought of being in the car for 3-hours along a windy road with wiggly kids, didn’t sound like much fun… So, instead of making the entire drive we did the Twin Falls hike which is pretty much at the start of the Road to Hana. It was a pretty easy hike and it didn’t take much time at all to get to the falls. And while I would recommend sneakers or water shoes, I managed to do it in slippers. The kids had no problem getting to it and while they wanted to jump in, I had to put the brakes on that idea. As you can see, my older son really “went out on a limb!” BTW, this also falls in the FREE category. Nakalele Blowhole and Maui’s Heart Shaped Rock – This was a last-minute add to our agenda. We decided to trek to Lahaina for breakfast at Slappy Cakes and got the idea to check out these landmarks since we’d be on that side of the island. About 8 miles north of Kapalua, park when you see the mileage marker that says 38.5. You will literally be pulling off to the side of the road, and you will see other people doing it too. Once again I opted to keep my slippers on, but for this hike, you are literally going down on dirt and rock, so shoes are probably a better idea. The kids were pretty amused watching the tide come in and out, and seeing how it would spout out the blowhole. We did see some pretty good ones, where they got sprayed, but catching that on camera requires a little more patience and skill than I have. Please be careful with the kids (grown ups too), when it’s a little more “active,” it can be dangerous. And, across from the blowhole you can also find a heart-shaped hole that’s formed in the middle of the rocks. LOVE! Snorkeling – Of course when you’re on an island, going to the beach and taking part in some water activities is a must, and snorkeling is a great way to see some ocean wonders. One option is to take a snorkel boat, where you sail out to a destination with prime snorkeling conditions. On this trip we chose to sail an afternoon excursion with Pride of Maui. 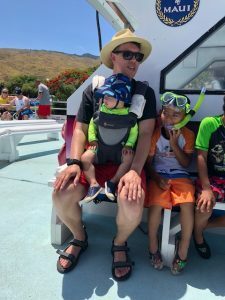 This was a great decision, because we went in the afternoon for a turtle snorkel, and didn’t have to wake up too early, and it was a shorter sail – perfect for kids, plus it was much more budget friendly for us. Food, drinks, equipment and instruction were included, and I would highly recommend it. One of the highlights of the trip was actually swimming and seeing sea turtles in the ocean! After the snorkeling and on our way back to shore, they fire up the grill and BBQ, while you can take in all the views from the open water. 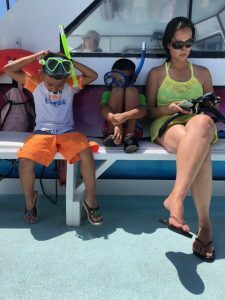 Another option for a family friendly snorkel boat is Trilogy I have sailed with this tour company in the past and they provide exceptional service and experiences in Maui too. 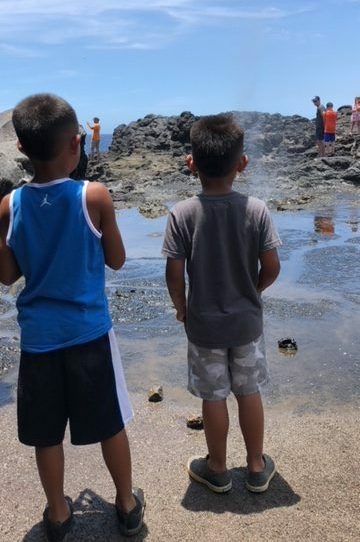 And if going on a boat isn’t your jam, there are several spots on Maui where you can swim out to a reef from shore and see all kids of sea life. 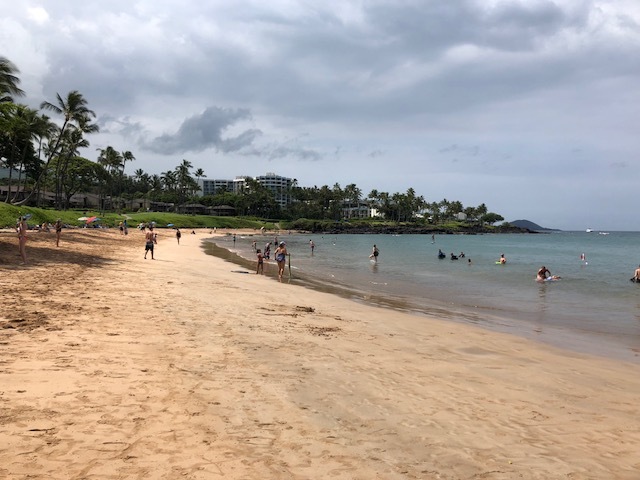 We went to Ulua Beach in Wailea, where the sand is soft and the water is calm. I didn’t have to swim (walk) out very far to see tropical fish and the vibe there is very relaxing. Hawaiian Luau – Whether it’s your first time to Hawaii or you are a regular visitor, a luau is always a good time. It’s an opportunity to learn more about Hawaiian (and Polynesian) culture, with vibrant performances, traditional island foods and (usually) an open bar! Who doesn’t love a good luau!? 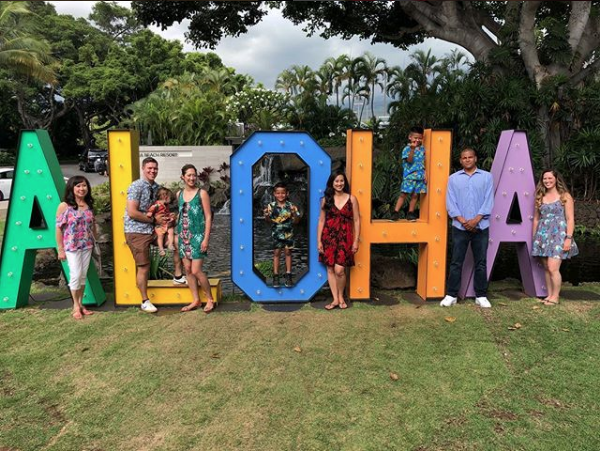 On this trip we took in the Te Au Moana luau in Wailea. 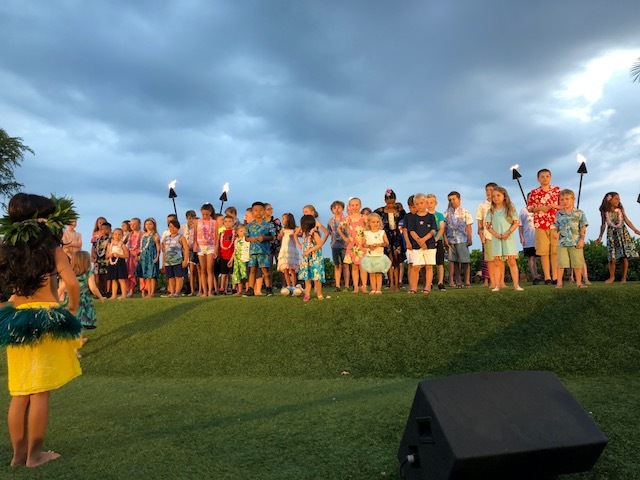 It was a great dinner show, where all the keiki (kids) were invited to get up on the stage and learn a little hula, plus we snapped photos with the performers after the show too! 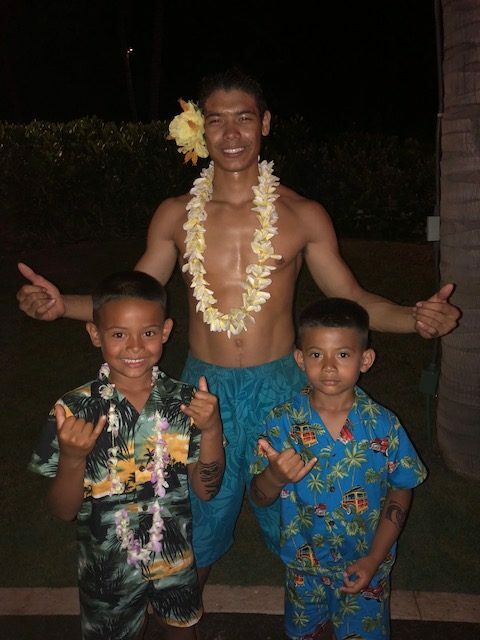 I also splurged on these fun Hawaiian print shorts sets for my boys and they couldn’t wait to wear their festive outfits for the occasion. 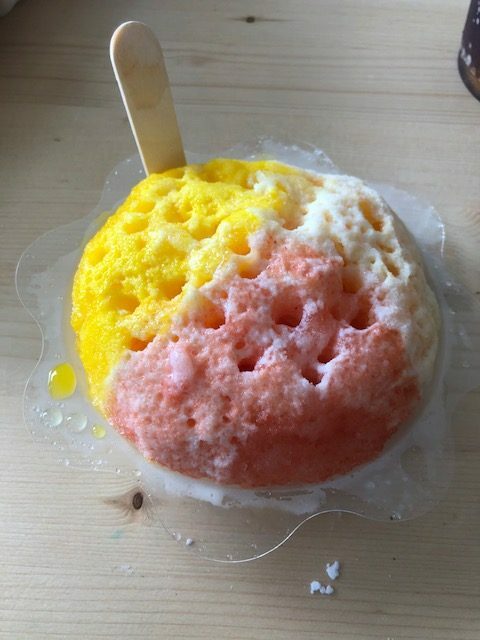 Hawaiian Shave Ice – Vacation is a great time to indulge in desserts and the one dessert you can’t pass up in Hawaii is their famous shave ice! We pretty much had shave ice every day of our vacation and did a tour of a few of the many spots where you can feast on the tasty desserts. Watch a Hawaiian Sunset – The sunsets are really gorgeous in Maui and it doesn’t cost a thing to enjoy one! We stayed on western side of Maui in Kihei, and pretty much anywhere along the shoreline made for a great spot to watch the sky and see al the colors as the sun goes down. Be sure to check what tie the sun sets, and get there at least 30 minutes ahead of time, because it moves pretty quick, and you don’t want to miss it.